PEACEFUL EXISTENCE is a boat I’ve had the pleasure of selling twice already! 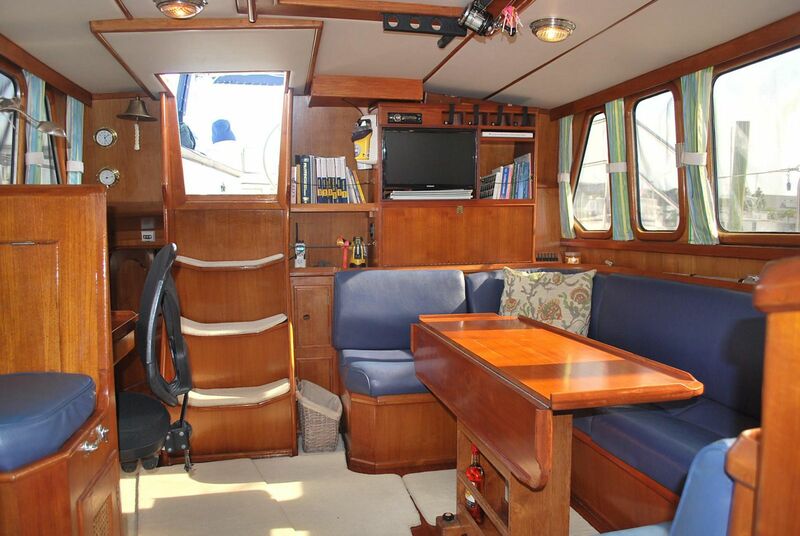 She is the “COMPLETE PACKAGE” for live aboard cruising. 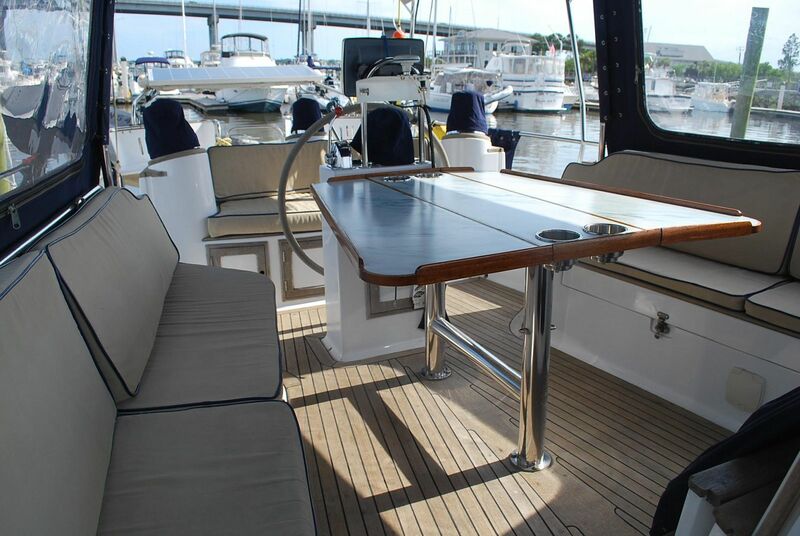 From her incredibly spacious cockpit with full water proof cover to her full stainless wrap around railing providing safety and comfort as you move about her decks to her remodeled galley and apartment like master suite she is an easy place to call home. 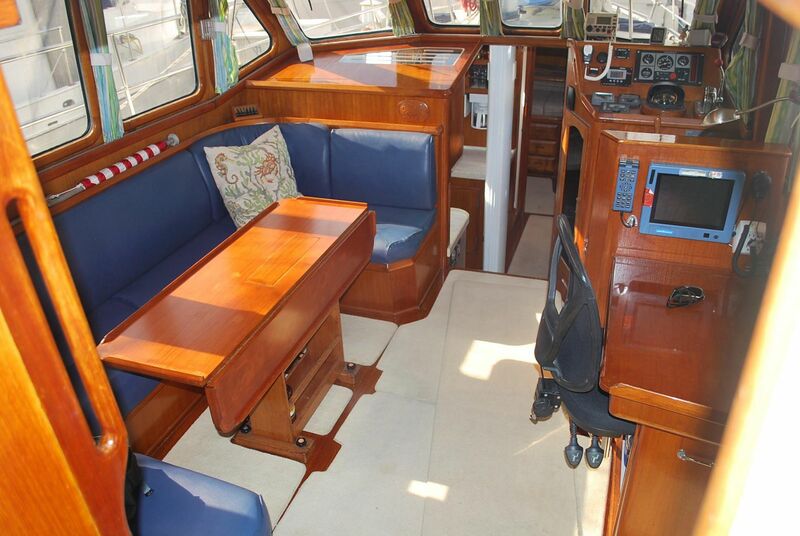 She has enjoyed several owners who have cared and maintained her to standards well beyond most boats. 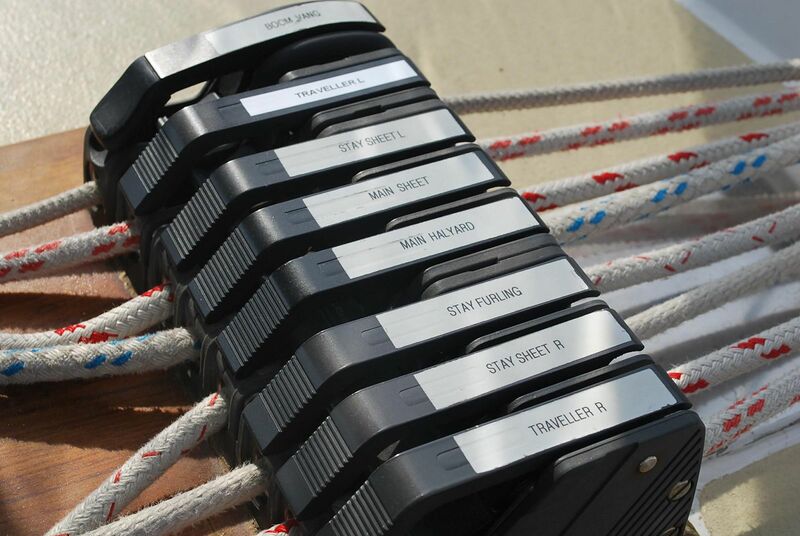 Two steering stations, make a her comfortable in all kinds of weather! She sails very well and will surprise many as she sails by in open water. Peaceful Existence is a solid cruiser with all the options, she must be considered if you are looking for a boat that will surround you with comfort and provide every option available. 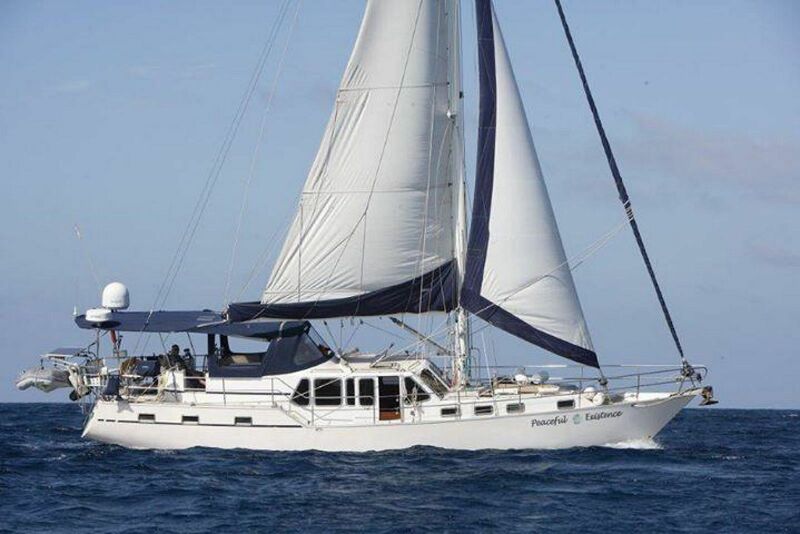 S/V Peaceful Existence is fully outfitted for cruising and extended time away from marinas. See Full Specs for a complete list of equipment. She is truly a world-class sailing yacht that is ready for more adventure! Upon entering the salon you’re greeted with light and openness provided by the large “toughened” pilothouse windows. 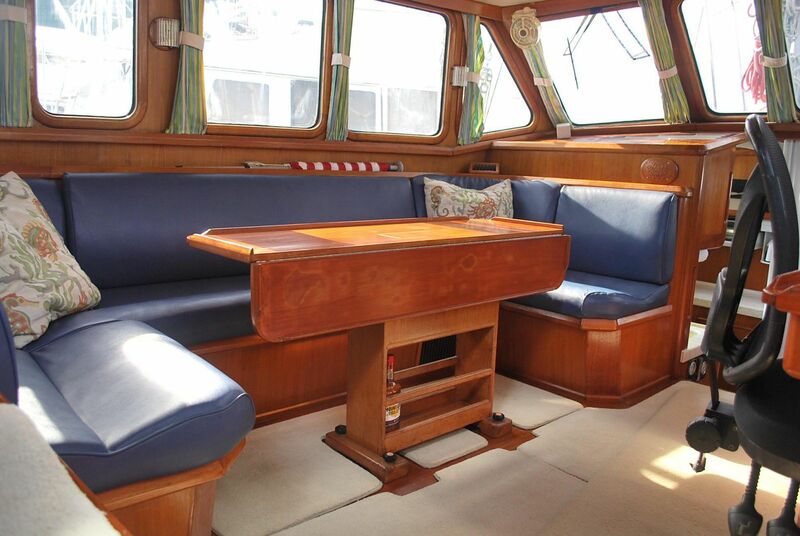 You’ll also notice the amazing craftsmanship of this yacht as evidenced by the teak and holly floors, teak walls and trim, and beautiful vented cabinetry throughout. To port is a long U-shaped settee with folding teak dining table with storage inside. 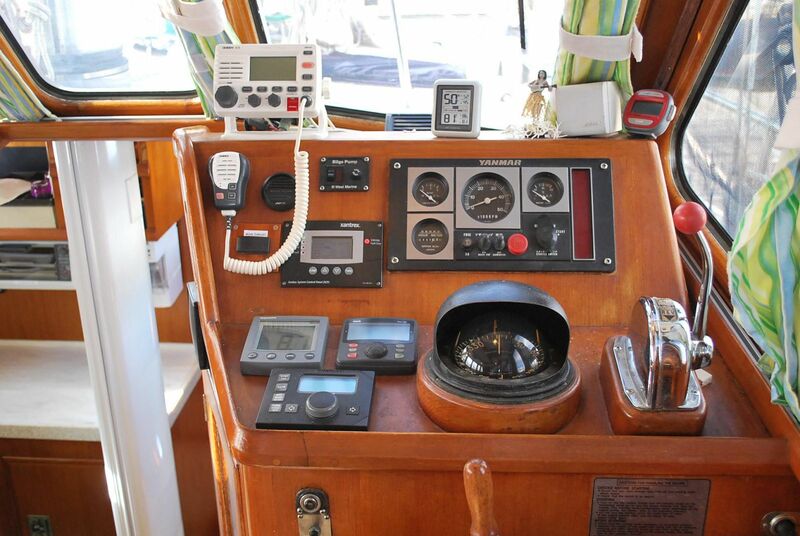 To starboard is the lower helm with full suite of electronics and just aft is the nav station with chart storage and a swivel seat. 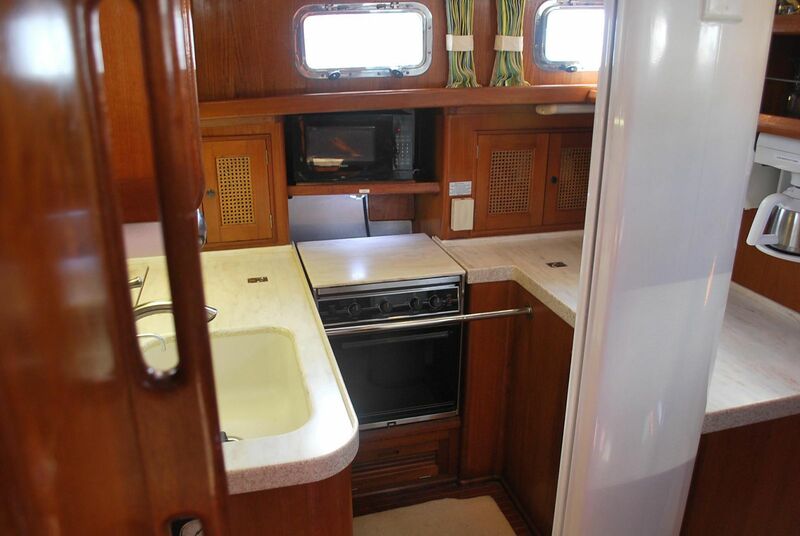 Forward and down two steps brings you into the fully remodeled galley which is well designed for cooking on the hook or underway. 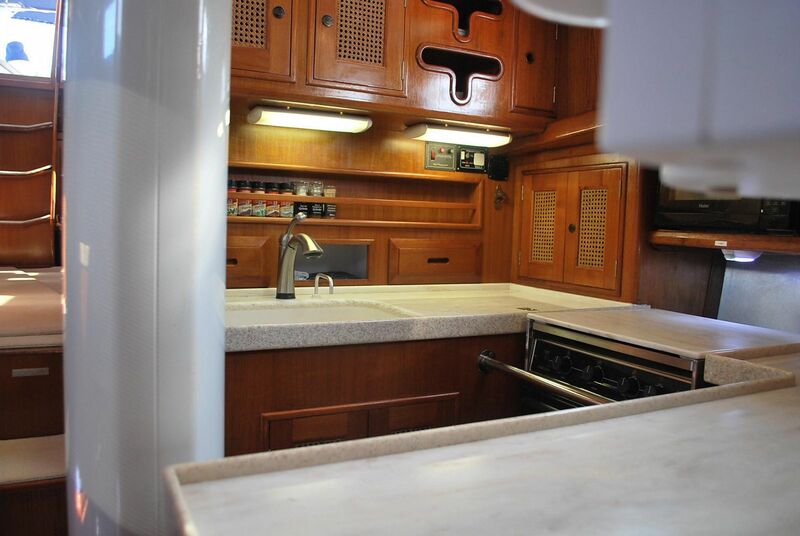 The galley features corian countertops, oversized sink, three burner Princess stove, 1 freezer and 2 refrigerators, and ample storage. 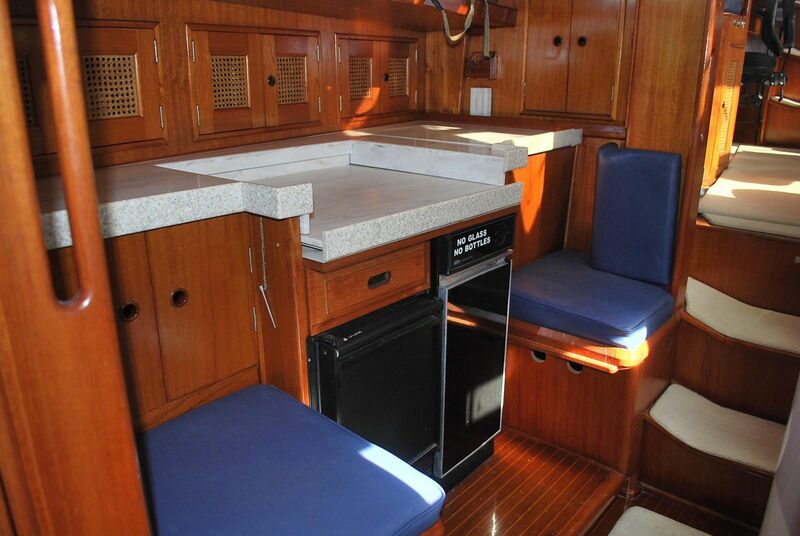 To starboard is a custom 2-person dinette with sliding counter and ice maker and trash compactor. Forward of the galley to starboard is the clothes washer/dryer. Moving forward to port is the head that functions as either guest head or day head. All the way forward is the V-berth with excellent ventilation, hanging locker and storage throughout. 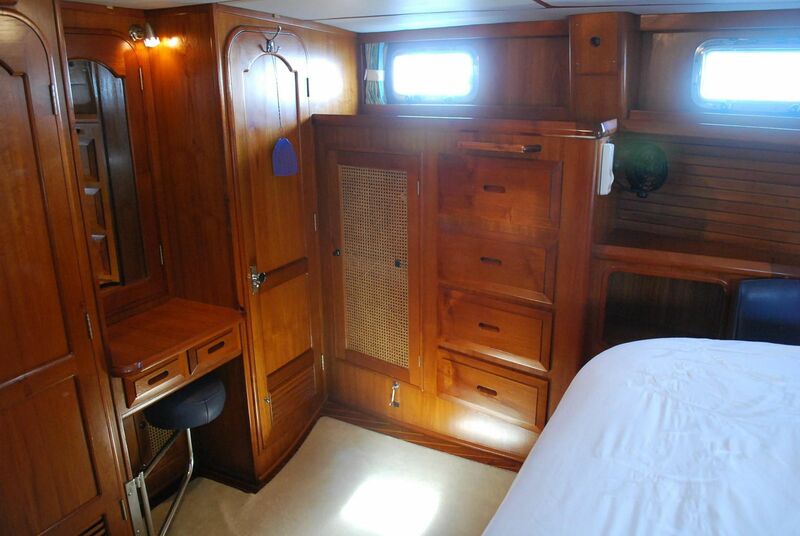 Back in the main salon moving aft and down leads you to the extremely spacious master stateroom with full centerline queen bed. The master also features two hanging lockers, numerous drawers, and built-in seating. Directly forward of the berth is a mirrored vanity with a swing out stool and extra overhead lighting. 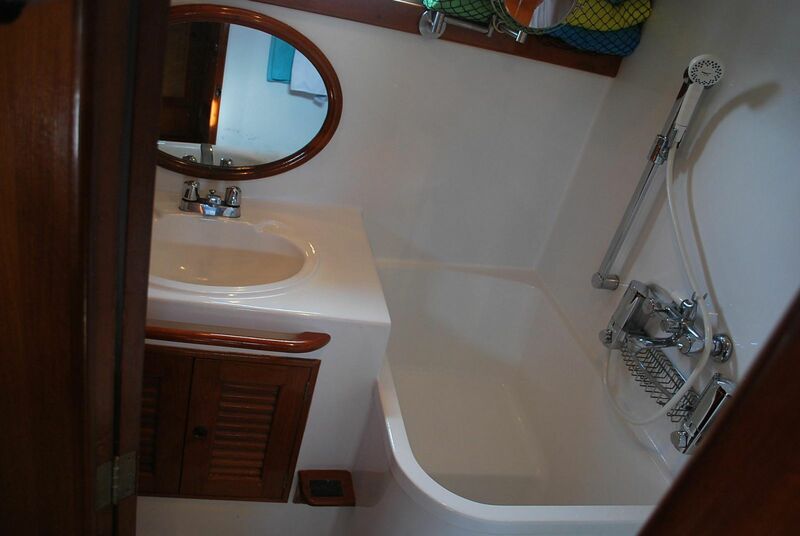 To port is the master bathroom featuring a sit down tub/shower, vacuflush head, and dual medicine cabinets. Another amazing feature of this yacht is the well-executed cockpit and aft deck. The cockpit features comfortable and protected seating for up to 8 around a folding table. 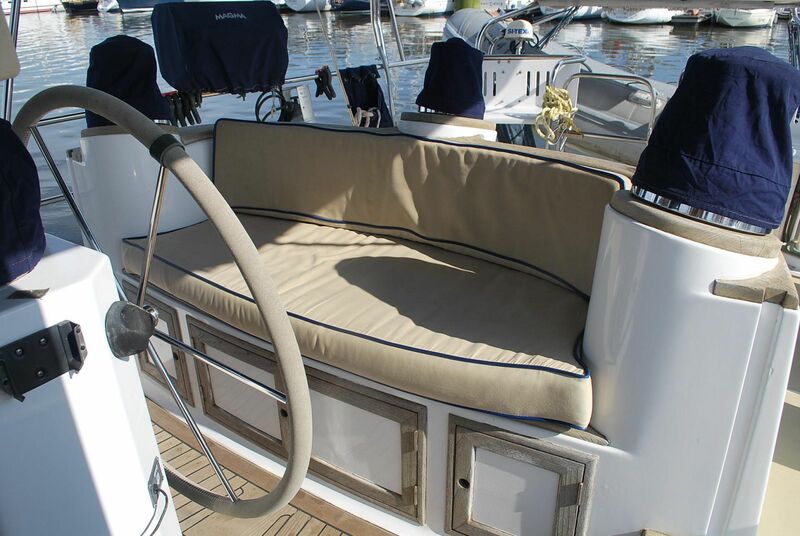 The helm settee can seat 2 and offers access from both port and starboard. 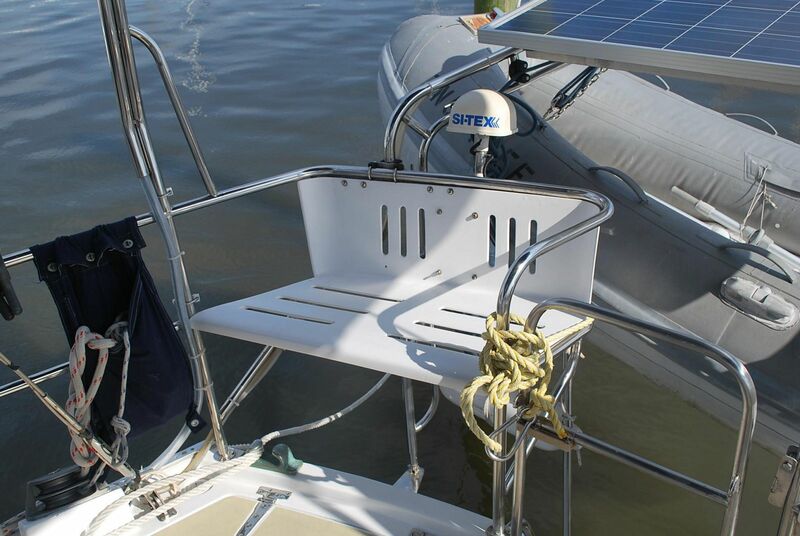 The helm provides excellent visibility and is within close reach of the primary electric winch and the aft jib winches. The aft deck is accessed from either port or starboard and features integrated stern seating for up to 4 as well as a walk-through transom. 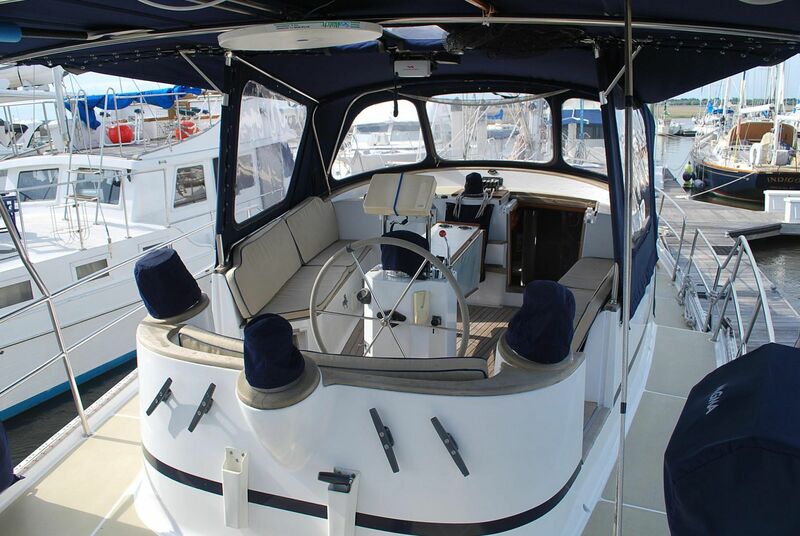 The entire cockpit and aft deck is covered by a custom dodger and bimini and safety is provided by oversized stainless steel railing all around. 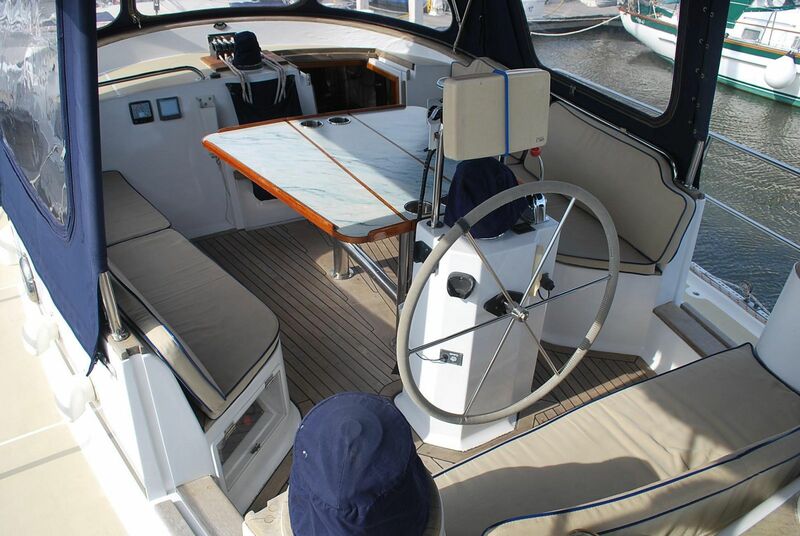 Access to the foredeck is provided by wide side decks with hand holds throughout. 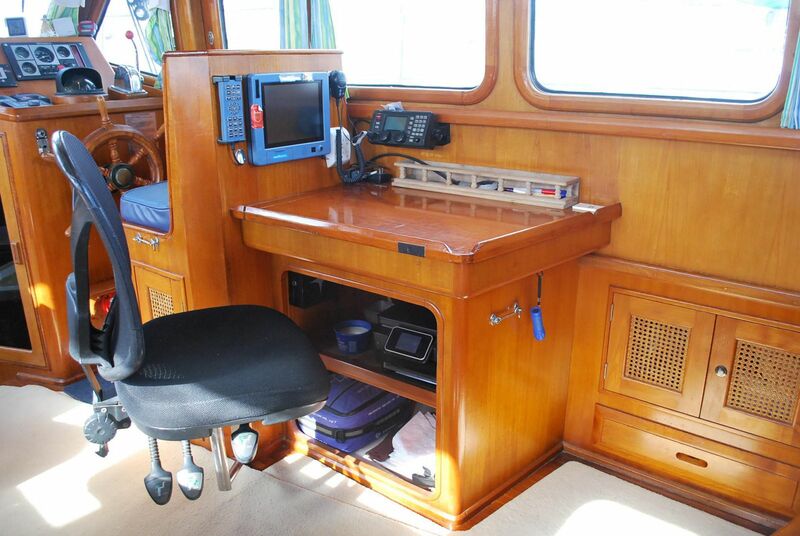 The entire layout of the cockpit and aft deck is exceptionally functional for both offshore sailing and harbor cruising! Professionally renovated in 2013 with corian countertops and oversized sink, stove cover, center-pull out breakfast dinette table for two, built-in spice rack, and overhead plexiglas insert for optimum light. Engine room access is provided through the salon floor with large opening hatches. 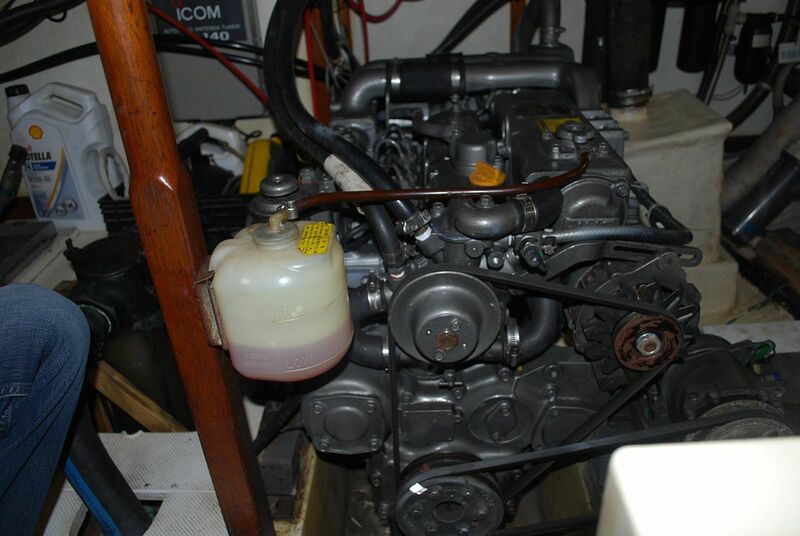 The engine room also houses the generator, raw-water intake manifold, pumps, hot water heater and watermaker. Yanmar 4JH2-UTE 95 HP with 6,495 flawless hours. Major 5,000hr service completed that included all new hoses/belts, new injectors, new water pump, heat exchanger cleaning. Meticulously maintained with maintenance records and service manuals available. Batteries and inverter/charger located in dedicated compartment under salon keeping cool and separated from engine room. 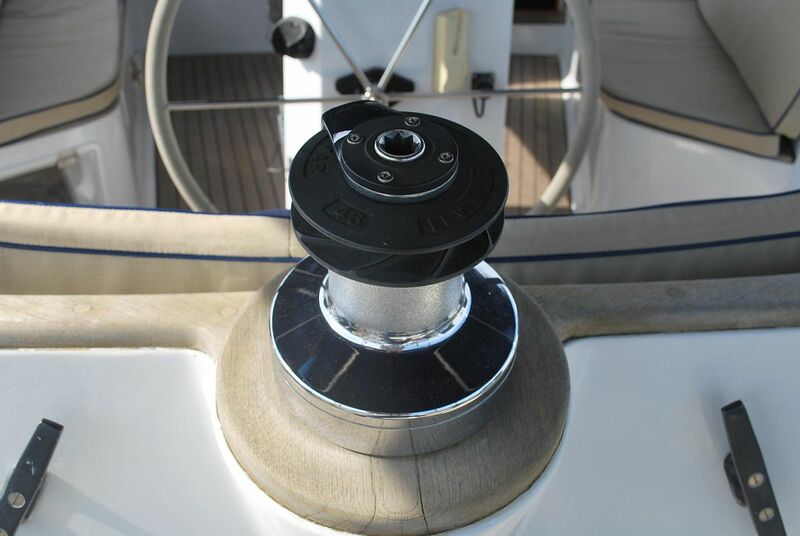 Jib: UK, 135%, Furlex roller furling, new Genoa sail stowed in a bag. All sails in good condition.